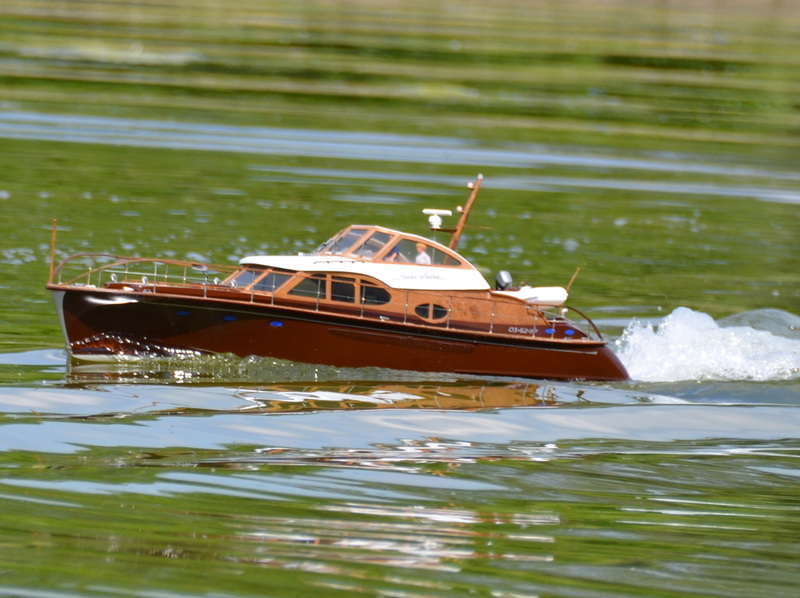 John Pates' little model of Earnshaw is based on a free plan in Model Boats magazine which itself was based on the real vessel TSS Earnslaw. The TSS Earnslaw is a 1912 Edwardian vintage twin screw steamer which sails the waters of Lake Wakatipu in New Zealand. The model is mostly scratch built and has over fifty passengers onboard to give that realistic touch. Based on plans in Marine Modelling International magazine, Alan scaled the model up to approximately 1/16 scale and has been a work of love. With very little scale commercial fittings available Alan has had to make everything from scratch. The hull is a plank on frame made from 100 year old pine wood. Whilst the paddles are not fully functional, they do not feather, the model is very manoeuvrable and has an extremely large rudder allowing Alan to spin the model on its axis! The model has a fully working smoke generator to recreate that all essential steam look. Alan is still finishing this impressive model after four years looking for new crew members and getting new flags made. The project was started in November 2011 with the kit from Graupner and was finally launched on 30th June 2013. There were several holdups during the build, initially due to missing parts in the kit, then having builders in and finally the nice men at Customs and Excise taking three months to clear some parts I had ordered from the USA. This model was scratch built in the 1970's, I refurbished her completely in 2008. She is powered by a 12 volt 800 Tornado engine, it has a sounder generator of a diesel engine, also a smoke generator for the exhaust. She was probably built in the 1940-50's, built to the Bassett-Lowke plans. I acquired her in the early 90's. she was then powered by a Taycol electric motor, driving a gear box for 2 prop shafts. The radio system was a valve receiver and transmitter. Nowadays she is powered by two 12 volt 800 tornado electric motors. In her early days she was probably used in straight running competitions, as she is so long and slender. She is due for a complete strip down and refurbishment shortly. Length 51" beam 11"
The Sea Queen was originally a kit made by Aerokits Ltd, at a price of £10.23. This Sea Queen is a current kit made by Jokita I built it around 2 years ago. I made a few alterations to the boat, the main being I planked the decking, which is in pear & lime wood. Powered by one 850 Tornado 12 volt motor. length 46"
This kit was produced in the 1950's by Aerokits at a price of 69/7 shillings, the kit was supplied by A.A. Hales Ltd.I had one of these in 1957, which had a Kako motor, then later I fitted a Frog diesel engine, with a pixi single channel radio, which was either all left or all right. This model I collected from the North Yorkshire, in a very sorry state around 4 years ago. She is powered by a 12 volt 850 Tornado motor, which gives it a good speed.